Ink & Weave are giving you the chance to win one of three tea towels! Ink and Weave have a gorgeous range of 100% linen tea towels, all designed and hand-printed in Australia. + visit Ink & Weave online (www.inkandweave.com) and browse their range. Return here and comment below telling us which tea towel you would choose if you win! + for a second entry, visit and 'like' the ink & weave facebook page (www.facebook.com/inkandweave) and return here to leave a sdecond comment. + The winner will be contacted by email and must reply with their postal address within 14 days of notification. In the case that the winner does not contact us, a second draw will take place from the remaining entrants. + This prize is not transferable or redeemable for cash. *Don't forget to include your details, so we can contact you if you win!! 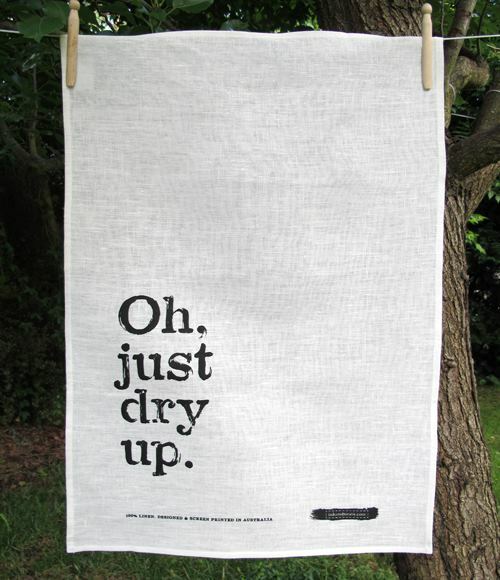 i love the just dry up one in your pic. I love wash the dishes. I love wash the dishes, dry the dishes, turn the dishes over. It reminds me of the nursery rhyme from childhood. My favourite is Tea frak - its describes me to a 'T'. All the designs are fab, but I love "it's gin o'tonic"! Oh just dry up - that's the comment of the day! I love them all. It's the "dry" humour of them all. :) My fav though, is the Yummy Mummy/Slummy Mummy. Loving the 'Tea Freak'. How great are these giveaways!! Love, Love Wash The Dishes! Would love to cover a blank canvas & hang in my kitchen. & liked on Facebook, please I want one! Hi, I love the 'Wash the Dishes' tea towel! All kids should know this one, and you can bet it will be stuck in my head today. The wash the dishes, dry the dishes tea towel would be my favourite as it reminds me of my childhood, what beautiful quality printing and linen - gorgeous!